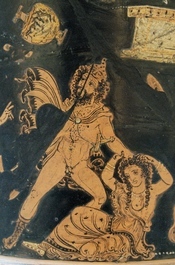 Dionysos is the son of Zeus, chief of the Olympians, and Semele, a woman of Thebes, according to the most used geneology. Dionysos is the god of wine and madness, vegetation, and the theatre, and was the focus of various mystery cults (which were not, perhaps, exactly cults, but let's not get into that). Oh, Thebes, nurse of Semele, crown your hair with ivy! Grow green with bryony! Redden with berries! O city, with boughs of oak and fir, come dance the dance of god! Fringe your skins of dappled fawn with tufts of twisted wool! Handle with holy care the violent wand of god! And let the dance begin! He is Bromius who runs to the mountain! To the mountain! Where the throng of women waits, driven from shuttle and loom, possessed by Dionysos! Dionysos is a strange god. Although he is best known as the god of wine, he is also a vegetation deity, a god of the liquid element, a death god, a god who comes into and changes, often irrevocably, the normal community life, and lastly the god of the theatre. His role as vegetation deity is obvious; he introduced the grapevine and taught the secrets of its cultivation and of fermenting wine. He is also associated with the fir tree and with ivy-- his symbol the thrysus, which his worshippers carry, is a branch or stalk of fennel tipped with ivy leaves or sometimes a pine cone. He is often paired with Demeter, goddess of grain. WriteWork contributors. "The Greek God Dionysus" WriteWork.com. WriteWork.com, 24 May, 2005. Web. 21 Apr. 2019.
i am a personal fanatic of greek and roman gods/deites. it was pretty accurate and good. one thought without researching i thought dionysos was the god who had the crippled leg and worked in the mountain as a smith for zues....but am probably wrong since you did the research. Well written and researched paper, quit informative and to the point. This paper gives a great overview of the Dionysos. Greek Gods Research Paper: This Essay is a research paper on the Greek Gods. It is about the important role that the Gods played in the lives of the Ancient Greeks. This essay is about the Greek God of Art, Apollo. This goes into detail about the life and times of Apollo and what he encountered along the way.